If you following a keto or low carb diet (and even if you don’t) you’re going to want to stick around for this post! Then again, if you’re just here looking for meals that can be mostly made ahead and stashed in the freezer, this one’s for you, too. 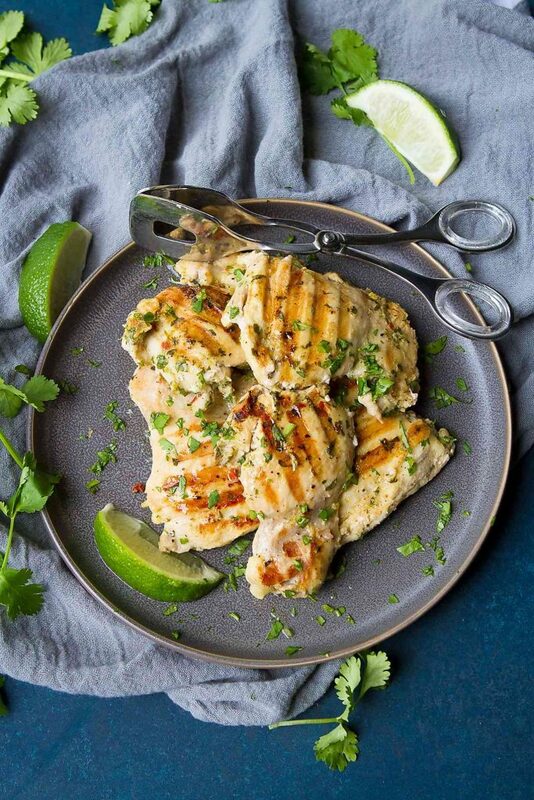 This grilled cilantro lime chicken recipe is straight from a new cookbook that will help soothe your weeknight dinnertime woes. I’ve been dying for an excuse to wipe the cobwebs off the grill and pretend that summer is here. 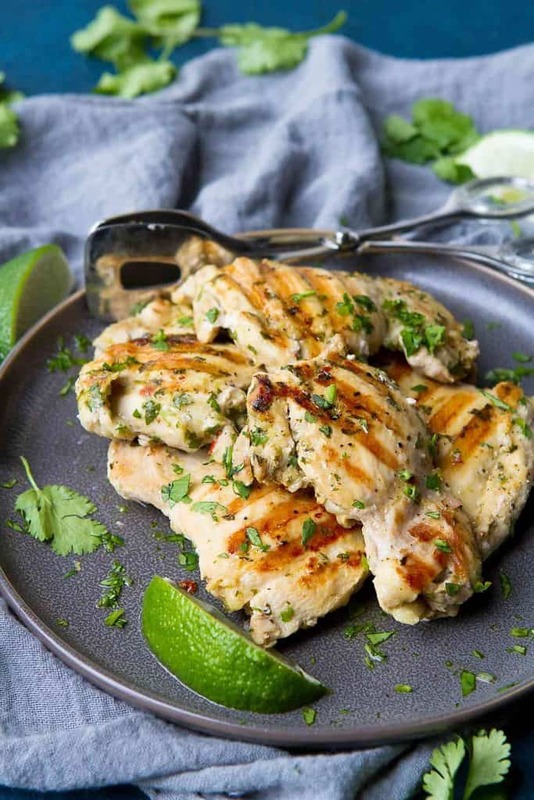 There’s nothing like a great grilled chicken recipe, served alongside sauteed cauliflower rice and grilled veggies to get me into that “grill like a girl” mood. Now that the floodgates have opened, I’ll be grilling lemon butter shrimp, chicken kabobs and veggie tacos until I just can’t grill anymore. If low carb or keto is part of your life, you may already know about my friend, Carolyn Ketchum of the blog All Day I Dream About Food. Not only is she the low carb baking master, but she is also the author of two cookbooks, Everyday Ketogenic Kitchen and her newest book, Easy Keto Dinners (affiliate links). 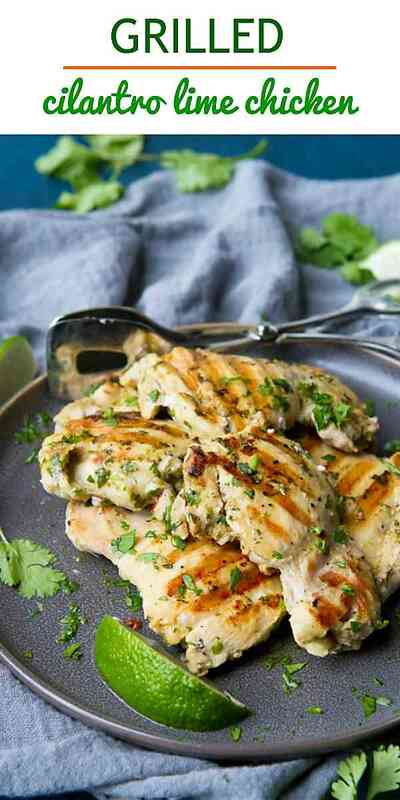 Flipping through Carolyn’s book, this cilantro lime chicken was just one of the many recipes that caught my eye. Others on my must-try list? One-Pan Jamaican Jerk Chicken & “Rice”, Mexican Cauliflower Rice Skillet and Instant Pot Chile Verde. Plus, there’s a really helpful section on “easy tips and shortcuts” for making mealtime prep more manageable. Like most marinated meats, letting the chicken rest in the marinade for several hours imparts the most flavor. That being said, you can still get a really good result by marinating for just 1 hour. Pour all of the marinade ingredients into a large resealable plastic bag. Add the chicken thighs, seal the bag, then massage the chicken to coat with the marinade. For grilled chicken, I prefer using chicken thighs since they tend to juicier and more tender than boneless, skinless chicken breasts. However, I’m guessing this marinade would still be a great option for chicken breasts. The recipe in the book calls for cooking the chicken thighs for 8 to 10 minutes per side. However, I’ve had the most success in the past by cooking boneless, skinless chicken thighs for 4 to 5 minutes per side. That held true in this recipe, too. Everyone’s grill is a little different, so I suggest using a thermometer, which should read 165 degrees F for the chicken to be done. As noted in the book, the chicken can be frozen in the marinade (in the resealable plastic bag) for up to 1 month. Thaw completely before grilling. In a gallon-sized resealable plastic bag, combine the ingredients for the marinade. Add the chicken thighs and massage the bag with your hands to coat the chicken in the marinade. Press out as much air as possible and seal the bag tightly. Let marinate in the refrigerator for at least 1 hour or up to overnight. Preheat the grill to medium. Remove the chicken from the bag and discard the marinade. Grill the chicken until nicely browned and cooked though, 4 to 15 minutes per side. The internal temperature should reach 165 degrees F on an instant-read thermometer. 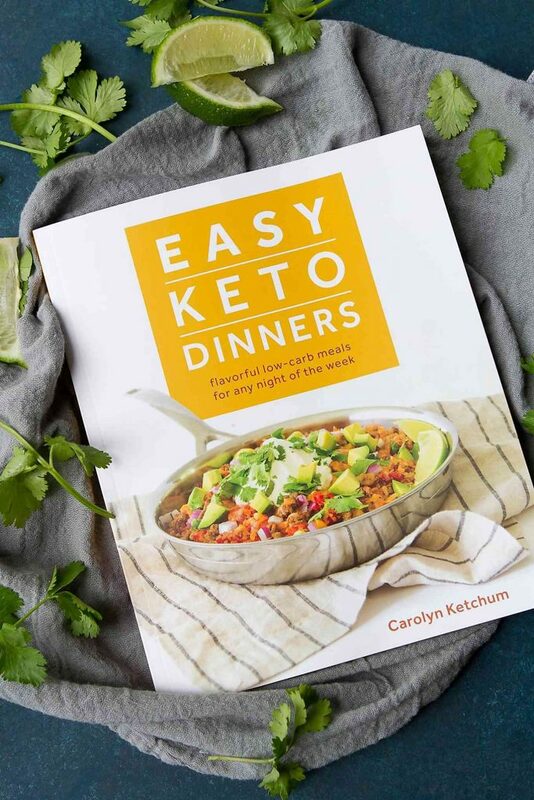 Recipefrom Easy Keto Dinners by Carolyn Ketchum is reprinted with permission. Wow, this sounds delicious! I recently just started doing WW and I was thinking I could even use this with chicken breast for less points! The only thing that would have points would be the avocado oil. I haven’t grilled with avocado oil yet, I can’t wait to try it. Thank you! How many thighs for this amount of marinade? I love your recipes. thanks for your posting them..
Hi Jeanette, thank you for your comment! It depends on the size of the thighs. The recipe calls for 1 1/4 lbs. of boneless, skinless chicken thighs. For the ones that I use, that equals approximately 8 thighs. When you’re counting the points, remember that the amount of avocado oil is negligible, since you’re leaving the majority of the marinade behind. I hope you enjoy the recipe! There are plenty more great ones in the book.